I admit. Its been so long since I made a proper recipe post. I am sorry for my absence and I hope to make it up with more recipes ! You know, life happened ! Juggling with studies, college, travelling, family, whatsapp groups, challenges; and no time to blog and yeah,no tasty food either. I am writing this post, although I have exams from tomorrow. I know all the followers of this blog and my social media accounts are actually waiting for all the recipes to come here, so I took out time just to write this wonderful recipe that is going to blow your minds. Now, to be honest, this recipe does not have any pretty pictures. As I decided to just try a thought in my mind and everything came out perfect ! So bear with short videos of the recipes, no fancy pictures ! Sorry again! 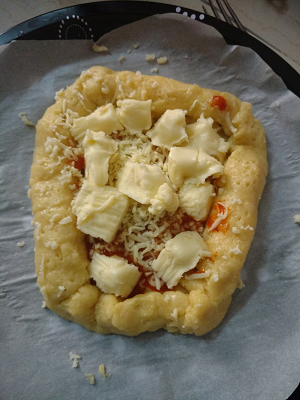 I completed 36 hours of water fast with some of the fellow ketoers in our Whatsapp group for Indian ketoers, and thought to treat myself with this beautiful Cheese-burst Pizza. 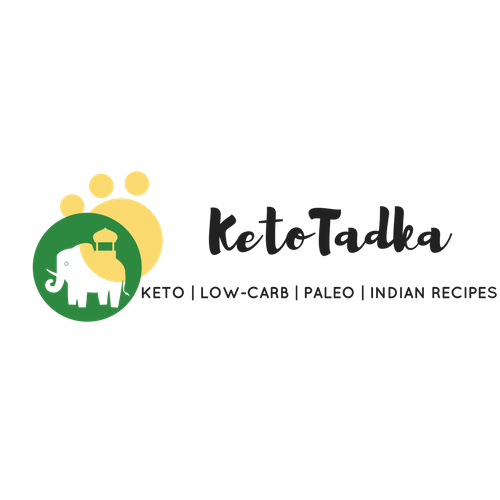 Its legit keto and easy to make, please don’t be overwhelmed with the videos. It is easy AF ! You will need string cheese (for people outside India, it is very easy to get it) or some long rectangular shaped or cut mozarella pieces. Simply, cut the block of mozarella in 5cm long rectangular pieces. You will need 4 of these for the cheese burst inside the pizza and some to sprinkle on top of the pizza. In total, you will need 400g of Mozarella block. I found the string cheese from some supermarket,so needed only 300g of cheese to make this pizza. Let’s get to the recipe, shall we ? But first, let us see how the pizza looks like ! I promise I will share some beautiful, blog-level pictures when I make it again. Almond flour- Unblanched or Blanched flour. Add the almond flour, salt and egg in the cheese mixture and mix it well until it forms a dough-like structure. Upto this point, it is like any other fathead pizza. Take parchment paper and pizza tray ( 26cm)Place the dough on the parchment, wet your hands and start pressing until you form a circle of diameter 18-20cm. Do no worry if the dough sticks to your hands, just wet hands again and start pressing again. Let it rest on the parchment for 5 minutes. Now, take the string cheese/ cut pieces of mozarella and place them on the edges. I placed them at clock position 12,3,6,9. Gently, roll the pizza base over the string cheese and cover it properly making sure there is no chance for the cheese to come out while baking. Do not worry if the pizza looks ugly or is not neat. Does not matter really. Spread about 2 tbsp pizza sauce (recipe below) in the middle and place the toppings you like and sprinkle enough mozarella on top. To make it even more tasty, just brush the rolled edges with melted butter and garlic lightly. Do not over do it or the edges remain soggy. Bake at 175 degree Celsius for 25 minutes. Keep checking after 15 minutes. If you find the pizza is still under-cooked inside, keep it for another 5-8 minutes. Enjoy wih your favourite low-carb, high fat dip. Spray some oil in the pan, put all the ingredients and bring it to a boil and let it reduce for about 8 minutes.